For business leaders who need information fast without the IT headache, ZAP Data Hub is low-cost, easy to use pre-packaged data management software. 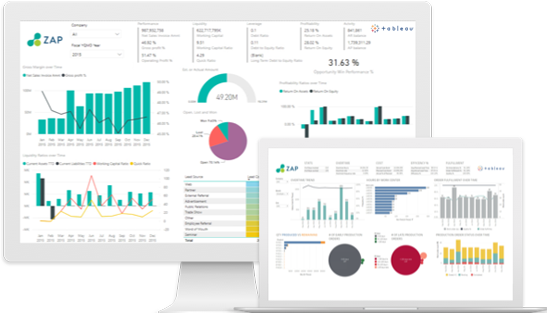 It provides quick and easy access to the data you need along with a set of pre-built analytics dashboards for Tableau. 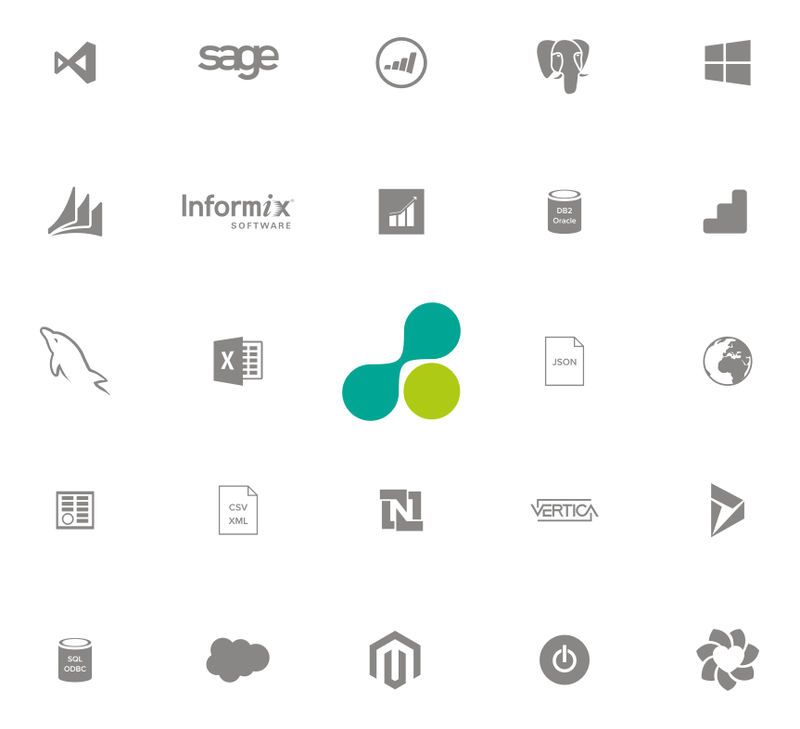 If your data sources include Microsoft Dynamics, Sage or Salesforce, ZAP Data Hub is far and away the best choice, thanks to ready-made data connectors, data models and 500+ pre-built analytics and calculations. ZAP Data Hub connects easily to many other ERP and CRM systems, financial systems, Excel, and SQL and Oracle databases, automating data accesses, unification and preparation. Take a look at the full list of data sources ZAP Data Hub works with. True business insight comes from analyzing data from multiple systems. Business leaders can achieve this instantly in Tableau thanks to ZAP Data Hub. ZAP Data Hub automatically accesses, unifies and prepares business data from all relevant sources then brings the information you need to life in vivid detail. Ready-made Tableau dashboards provide an instant 360° view with analytics and calculations from multiple integrated data sources on one screen. All this, out-of-the-box. No need for coding, technical training or key-man dependencies. And with data governance built in. 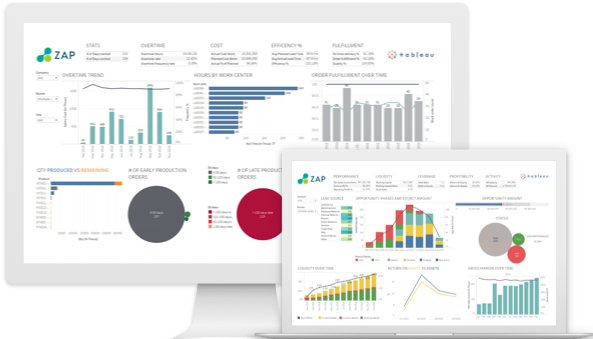 With ZAP Data Hub, sales leaders use our Tableau analytics to track metrics such as activity per opportunity, revenue/quota ratio and lead to closure rate/cost, taking data from CRM, ERP, and Excel. Marketing teams can access data from CRM, ERP, marketing automation and Google, to gain insight on metrics including customer acquisition source/rate/cost, campaign ROI, and MQL/SQL conversion rates. For HR leaders, ZAP Data Hub delivers reporting in Tableau by taking data from HR and financial software and qualitative- and document-based HR applications to deliver analysis on metrics such as attrition, absenteeism, engagement, and training. ZAP has over 500 pre-packaged analytics and calculations for all business leaders. Automate the access, unification and preparation of business data from all sources: ERP, CRM, financial systems, marketing, SQL, Oracle, and Excel. Pre-built analytics for senior managers provide instant access to key business metrics. 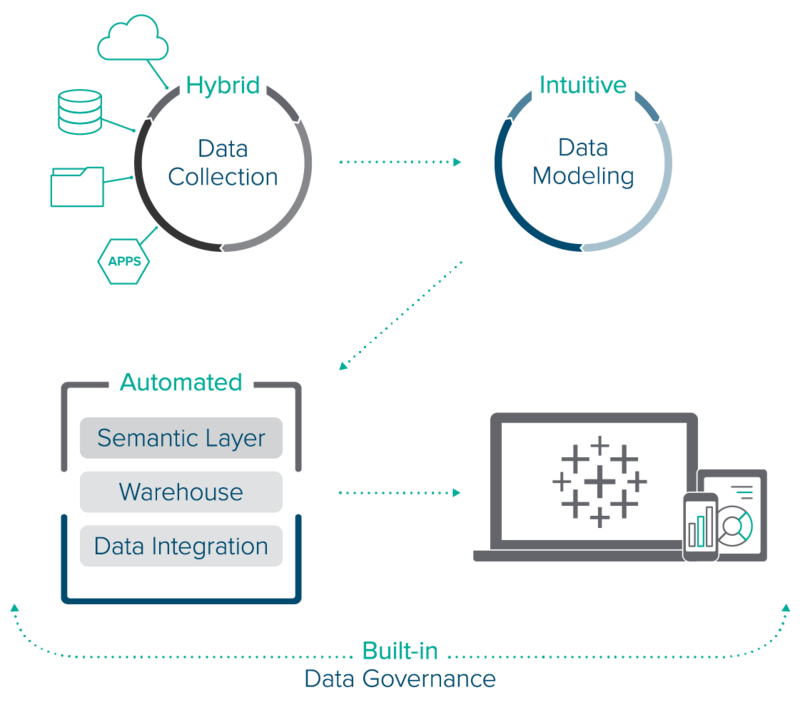 Enhanced analysis based on a feature-rich, governed and secure data warehouse with zero coding required. Manage all types of data: on-premise, in the cloud, online, or legacy systems. 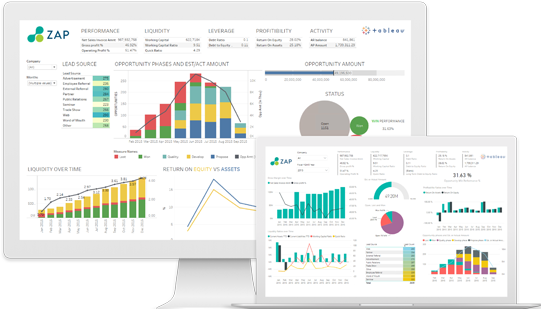 Achieve deeper, faster analysis and deliver true cross-functional business intelligence. Spend more time analyzing data and less time wrangling it. Data preparation tasks become focused on value-add activity and enrichment. Remove the risk of human error and minimize key-man dependencies. Save the time and expense of manual data management – and the limitations of accessing underlying databases directly with Tableau or Power BI. ZAP Data Hub’s Software as a Service (SaaS) offering is unique in the marketplace. It includes automated maintenance, back-up, disaster recovery, guaranteed 99.5% service uptime and compliance with security, privacy and governance standards. Your cloud-based data can be integrated and managed just as easily as your on-premise data. Any or all elements of ZAP Data Hub — e.g. application, data warehouse and/or semantic layer — can be deployed in any combination of on-premise or private cloud (Azure or AWS). ZAP Data Hub is built on Microsoft Azure and SQL Server and includes AD, Azure AD, and ADFS enterprise authentication.